Let’s set the context. It’s 2012, and a hell of a lot has changed since the early days of Planet software (~2006) – since the days when it was enough to just aggregate a community’s RSS feeds and call it a “river of news.” It’s almost an entirely different Internet now, and – most certainly – it’s a different Internet audience. 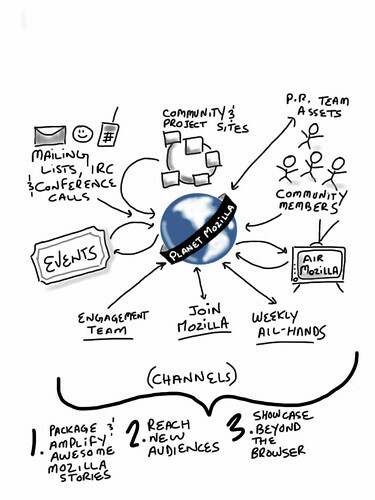 First, to avoid the confusion and emotions surrounding it, let’s drop the name “Planet Mozilla” for this exercise. We can do better, and why hitch our exploration to a quickly derailing train? In the past, we’ve noodled Mozilla Nation (think Digg Nation), Daily Mozilla or Daily Webmakers, and I also think that MozillaZine could be a fun way to reference the DIY culture that is developing inside of Mozilla via Mozilla’s Webmaker initiatives. Use whatever name works for you, or suggest some others, it’s not really that important right now. Second, I’ve believe that re-invention, or iterative improvement – while great in many situations – is not what’s needed here. With many entrenched systems, both technical, and meritocratic, there comes a time when routing around the problem – being “of the Internet, not just on the Internet” – is the more appropriate way to move forward. Thus, I would propose that whatever new idea, or envisioned product, or dream outcome that this conversation produces should simply aim to do a mind-blowingly better job at delivering information to Mozillians than Planet Mozilla does today. If it succeeds in that mission, the question of “What to do about Planet Mozilla” become irrelevant. Third, to avoid going down the software-centric path, I would propose that we think of this opportunity – that is, the opportunity to be the best information-delivery system for Mozillians, made by Mozillians, about Mozillians – not as a technical “plumbing” challenge, but instead as a challenge to be awesome at community engagement, curating and filtering the vast amounts of information in the Mozillaverse, and – most importantly – storytelling. And if the conversation veers toward software at times, because inevitably it will, let us agree to A) only discuss the most minimal of minimum viable products, and B) to be nimble, agile, and to “fail fast and forward,” because there are “known unknowns, and unknown unknowns” and we, no doubt, have a lot of both. All that to say, let’s start simple and figure out what works (and what doesn’t) along the way. Fourth, Planet Mozilla’s “beat”, so to speak, has always been limited to Mozillians with blogs who self-selected and opted-in to be aggregated on the Planet. It is, at best, a narrow view of what’s happening in Mozilla today. It goes without saying that blogs and RSS feeds are only one of many sources that information flows on the Web today, and not including information that flows from the other pipes – mailing lists, newsgroups, IRC, events, community calls, and so on, not to mention social media and Mozilla’s own outreach, campaigns, and communications – is a missed opportunity to deliver a more comprehensive Mozilla story. Last but not least – probably the one idea that I think about the most – is that the idea of “Sources going direct” is both empowering, and limited. Some people are great at public speaking, some at giving interviews, some at producing rapid prototypes, some at writing lengthy essays on governance in newsgroups, and some at the minutia of bit-twiddling to make our beloved Firefox start-up one micro-second faster. But, as a generalization, most people are not mind-blowingly excellent at telling their own stories. Call it humility, call it being busy, or maybe chalk it up to just not having gotten the hang of “talking out loud” – the important point is that we’re currently missing a lot of the most interesting stories and work in Mozilla because they’re not being told well, or not being told at all because we simply don’t know about them. When I think about Mozilla, I think of a city that is growing. At its core is a small city council (Mozilla’s board of directors and executives). There is an active city staff (Mozilla’s employees) and many people that work directly on city projects (project-based staff, consultants, etc.). Expanding out from there is a large community of people who are active citizens: the shop owners, academics, activists, and so on (mostly volunteer contributors to Mozilla projects like Firefox). Beyond that there are the 400,000,000 people who live in the city every day just going about their business (people who use Mozilla software or interact with Mozilla projects). So the opportunity ahead, the one that I’m excited to see a conversation unfold around, is: What would be required to bootstrap the best information-delivery system for Mozillians, made by Mozillians, about Mozillians? I have some ideas, I’m hoping you do too. Mexico: Week eight. All your base are belong to us. Mexico: Adventures in San Cristobal de las Casas, Chiapas.